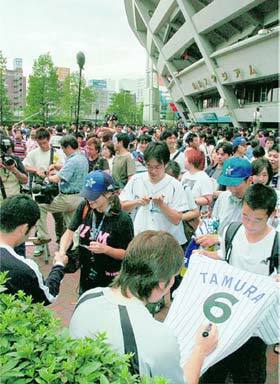 Players on strike sign autographs for fans outside Yokohama Stadium, where they practiced but did not play. The strike led to expansion and interleague play. For years prior to its introduction, NPB’s six Pacific League teams lobbied for some form of interleague play against the six teams of the then-more popular Central League. These pleas were scoffed at by the charismatic but blowhard generalissimo who ran the Yomiuri Shimbun and held huge sway over NPB policy, Tsuneo Watanabe. “You only want to make money off games with the Giants. Who’d pay to see Lotte play Chunichi? It’s a joke,” he said in various ways every time the issue was brought up. At that time, sale of terrestrial TV rights for each CL team’s 13 home games against the Giants provided the bulk of each CL team’s annual operating expenses, and none of them were in a hurry to replace a few of those games for home contests against unfashionable PL teams — until the mid-1990s that meant all PL teams with the exception of the Seibu Lions, whose golden age petered out in 1995. Unfortunately, the labor courts disagreed, slammed NPB for dealing in bad faith, Japan’s only baseball strike occurred, and NPB caved in. The Kintetsu Buffaloes and Orix BlueWave became the Orix Buffaloes, but NPB agreed to expedite a process for an expansion team that would keep the PL at six teams. Owners had argued this was impossible to do between the summer of 2004 and the autumn, when a new club would have to take part in NPB’s amateur draft. Another provision of the settlement was the introduction of interleague play — in order to help the PL teams survive. At first it consisted of 12, three-game series, two each against each team in the opposing league. Interleague play in NPB is a little oasis between the start of the season and the all-star break, and all the interleague games are completed before league play resumes through the end of the regular season. Two years later, the CL pushed for a change to 24 games, and 12, two-game series, calling the original 36-game format they came up with “intolerable.” The CL’s next brilliant idea, a 24-game setup proved even worse, because it meant teams were sometimes off on Friday, a prime day for baseball, and a more hectic travel schedule. So in 2013, the CL once more said, “This 24-game interleague format is ridiculous,” mindful not to mention that it was their idea in the first place. The real problem of interleague has been the perception that the CL clubs just simply aren’t as competitive as the PL teams. This has been fairly obvious in the Japan Series as well, which the CL has won just 3 times since 2003. So far, only one CL team, the Giants has led the interleague standings, and entering play on Friday, heading into the final few games in PL parks, the interleague-leading Yakult Swallows were the only CL team without a losing record against the PL. 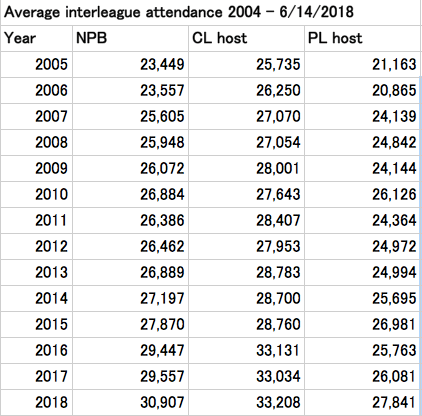 Despite the CL’s mediocre showing and predictions of gloom and doom, average interleague attendance has increased every year but one since it’s inception in 2005. That year was 2011, when Japan was reeling from the March 11 earthquake and tsunami and the subsequent nuclear disaster. Through the games of June 14, attendance had increased this season by an average of 1,349, although that will deccline a little next week when the rainout makeups are figured into the equation. This year, both leagues have drawn more for their interleague games than they have for games against league rivals prior to the start of interleague in June: 33,208 to 33,112 for the CL, 27,841 to 26,024 for the PL.